Leawo iTransfer provides perfect solutions for iPhone transfer, iPad transfer and iPod transfer issues. It can be used for transferring many kinds of files among iOS devices, iTunes and PCs. 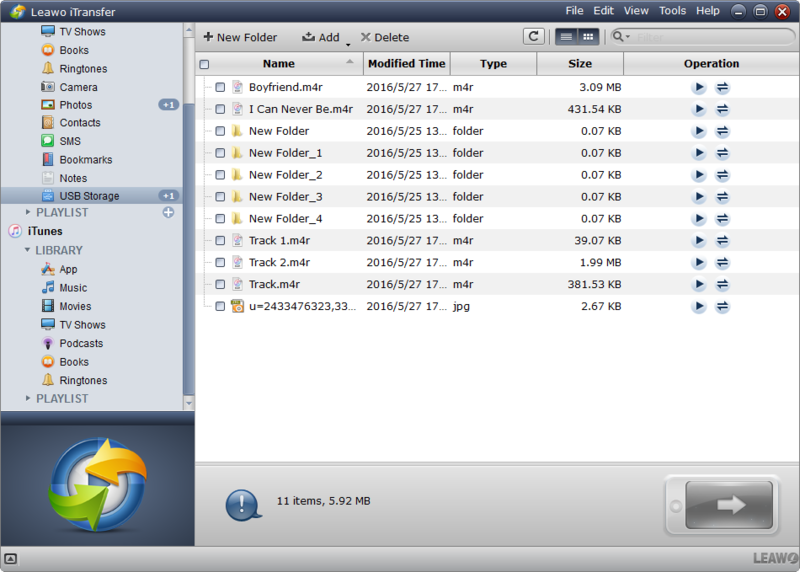 Leawo iTransfer is helpful for backing up iPhone, iPad and iPod (touch) files to computer. It makes the iPhone, iPad and iPod as flash drives so that users can put anything they want into their iOS devices. 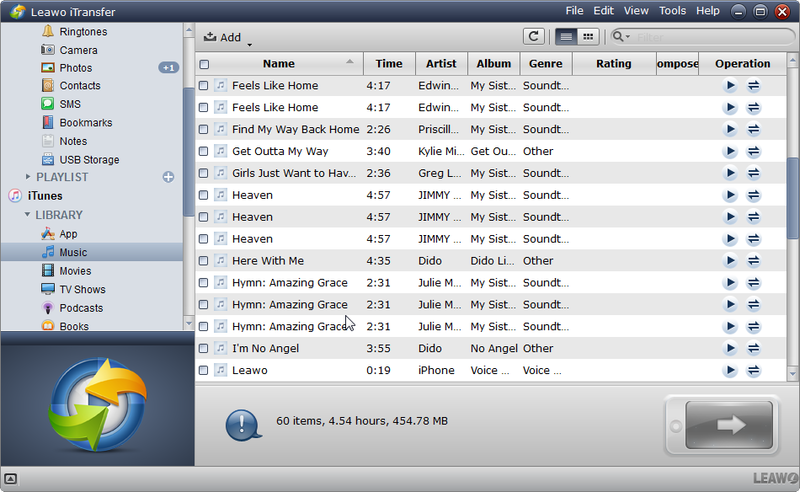 Moreover, Leawo iTransfer allows users to manage the playlists of the iOS devices and iTunes within the software. The following guidance will show you the full functions of Leawo iTransfer. The guidance will be divided into 5 parts. In every part, iPhone is taken as an example. Step 1: : Connect iPhone to Computer. The starting image of the software is just like below. When you have connected iPhone to computer, the software will show the detailed information of the iPhone. The library and playlists of iPhone will show in the left sidebar accompanied with the “Recommendation” and the library and playlists of iTunes. Users can get recommendations of the hot apps, music, movies and books from AppRevels.com. 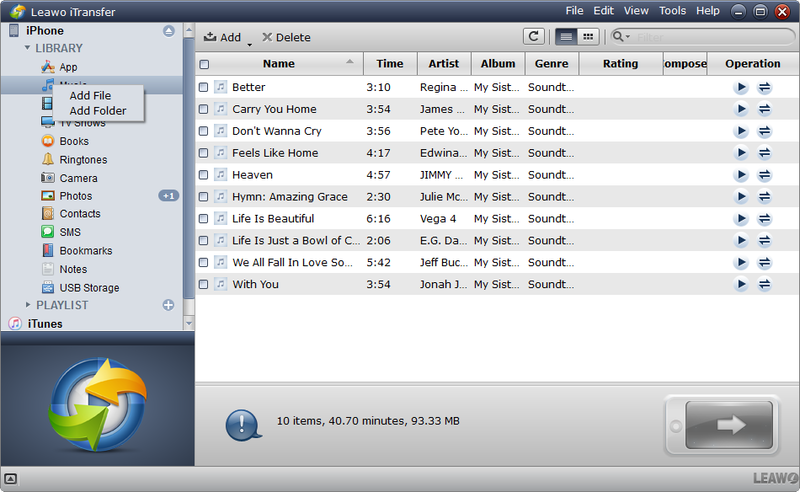 Also, users are allowed to manage the iTunes contents within the software (The Part 2 will show you the detailed guidance). Step 2: Add files to computer. 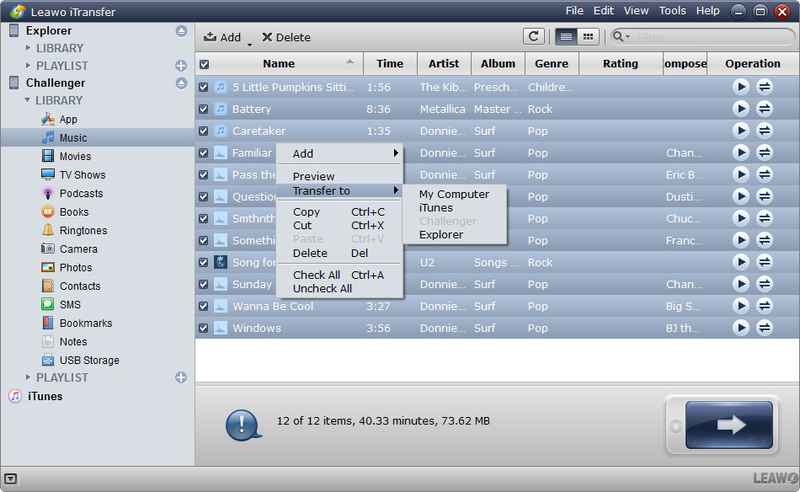 Users have 3 ways to add files from computer: the first one is dragging and dropping the computer files directly into the window of the software; the second way is to right-click the name of the library and choose “Add File” or “Add Folder”; the third one is to click “File” on the upper right corner of the software window, and then choose “Add > Add File/Add Folder”. 1. 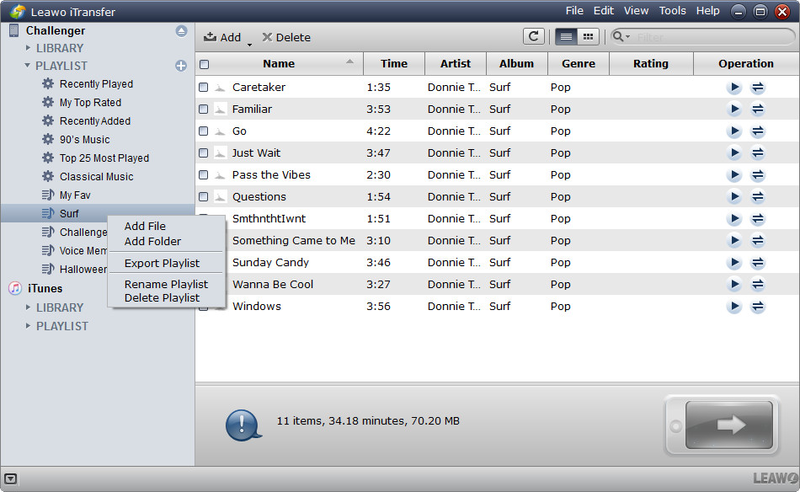 File: includes options of “Transfer to”, “Add”, “Preview”, “Playlist” and “Exit”. a. Transfer to: used in the iOS devices to computer transfers, iOS devices to iTunes transfers and iOS devices to iOS deivces transfers. 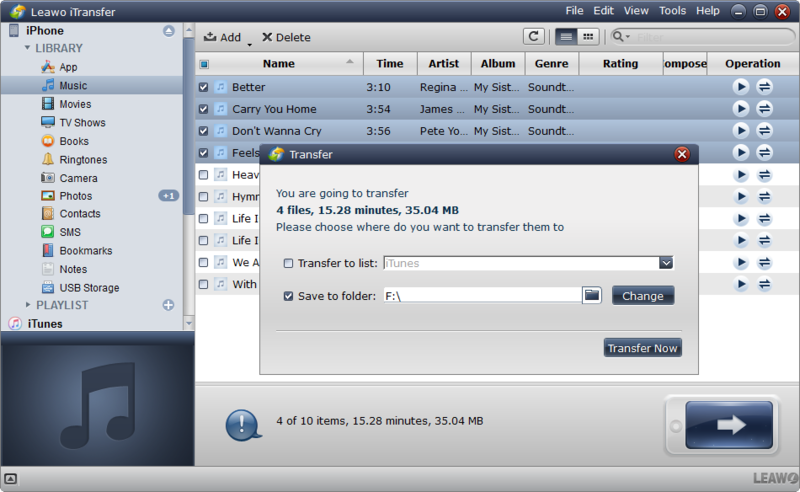 When finished choosing files for transferring, click the “Transfer to” and choose where to transfer the files to. b. Add: used in the computer to iOS devices transfers. After choosing the library to add files, click “Add File” to add one or more files from computer; Or “Add Folder” to add a folder of the certain kind of files to iOS devices. c. Preview: used in browsing files in the software. Choose a file and click “Preview”, then a pop-up screen at the left bottom shows up to play the file been chosen. d. Playlist: used in managing playlists of iOS devices or iTunes. 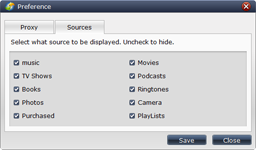 Choose a playlist at the left sidebar and click “playlist”, users can choose to “Add Playlist”, “Rename Playlist” and “Delete Playlist”. e. Exit: used to shut down the software. 2. Edit: includes options of “Copy”, “Cut”, “Paste”, “Delete”, “Check all”, “Uncheck all” and “Preference”. a. Copy: used in copying files within the software. 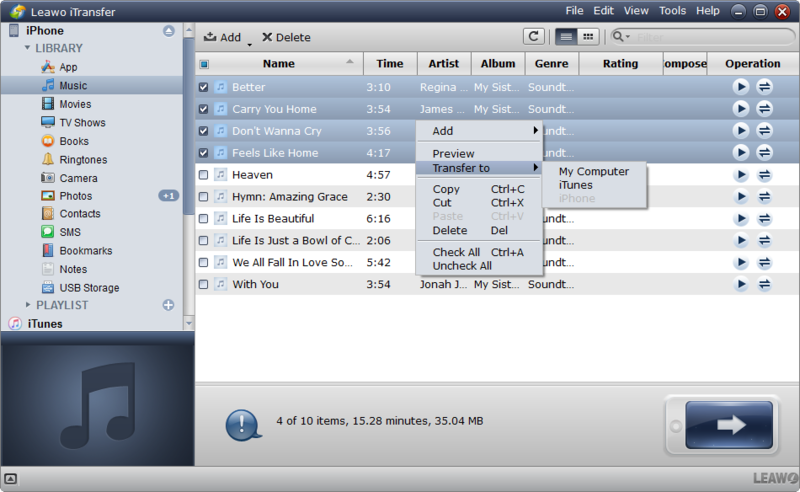 For example, if users want to copy a song from the Music Library to the Playlist, they can use this option to save time. b. Cut: Almost like “Copy”, but once cut the file, users will lose the file in the original position. c. Paste: Once “Copy” or “Cut” the file, users can “Paste” the file within the software. d. Delete: used for deleting files within the software. e. Check All/Uncheck All: used for checking the files. If users are going to transfer all the files to computer or iTunes, they can choose “Check All”; if they only want to transfer certain files, they can choose “Uncheck All” and then select the certain files they want. 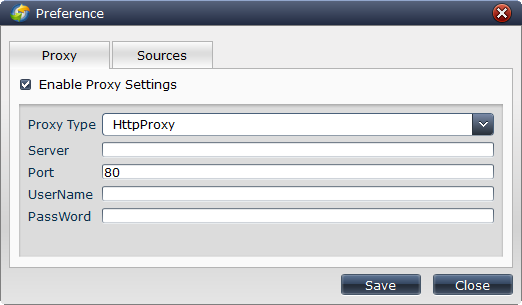 f. Preference: used for setting up proxy and the sources of the software. 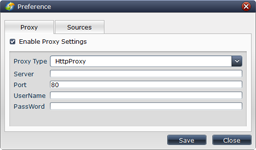 Users are able to set up the proxy and choose the files that users want to display in the software. 3. Device: includes “Refresh Device” and “Eject Device”. a. Refresh Device: After transferring files, users can click “Refresh Device” to make the software scan the device again. Users can check whether the files being transferred or not. b. Eject Device: make the software stop scanning the device. a. Help Topic: link to the page of Leawo iTransfer User Guidance. b. Support: link to the support page of Leawo iTransfer. c. Feedback: send your feedback of Leawo iTransfer to the company, and they will make improvements according to your feedback. d. Check for Updates: check for the latest version of the software. 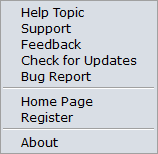 e. Bug Report: if users find bugs when using the software, they can send the bug report to the company. f. Home Page: link to the home page of Leawo iTransfer. g. Register: Once users paid for the software, they will get the registration code, and then users can register the software by clicking this option. h. About: Show the version and website of Leawo iTransfer. 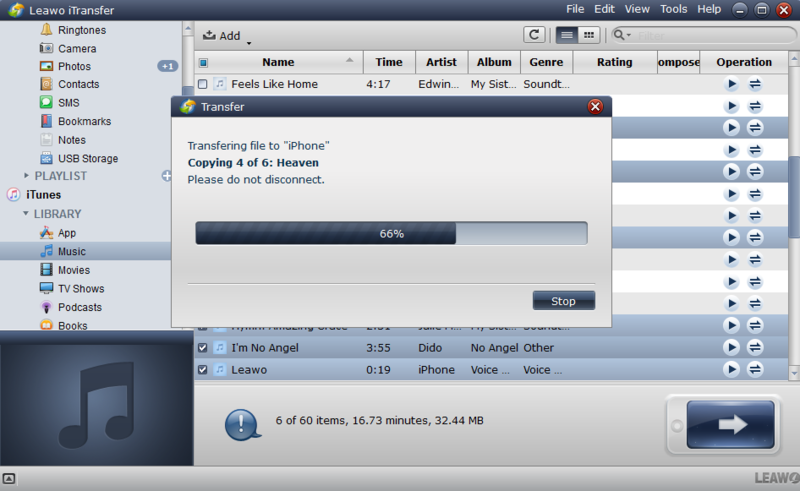 Step 3: After adding files to the software, the transfer begins. A dialog of transfer process will show up. This dialog shows you the percentage of the transfer, and the names and numbers of the files being transferred will also be shown. When the transfer is ongoing, please don’t disconnect the iOS devices. Step 1: Connect the iPhone to computer and run the software. The software will automatically detect the iPhone and show the Library of iPhone. The Library of iTunes will be shown below the Library of iPhone. Users are allowed to transfer music, movies, TV shows, books and ringtones from iTunes to iPhone. 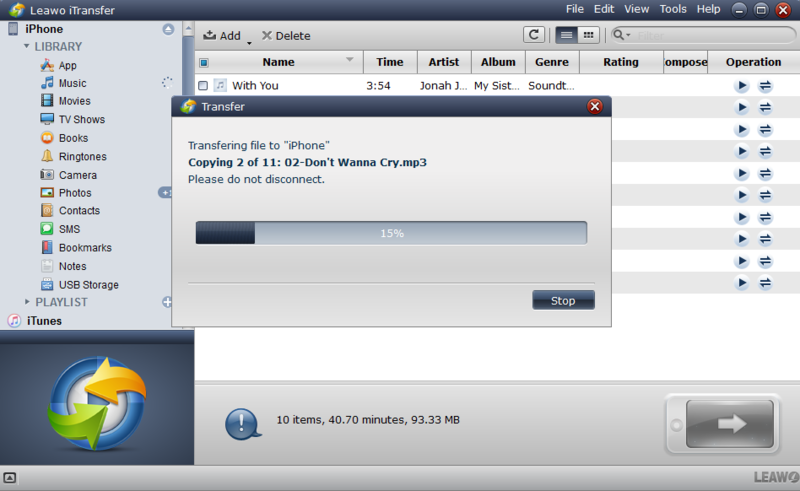 Step 2: Click the transfer button to transfer all the files. Click the transfer button (the dark-blue right-arrow button at the right bottom of the software) to transfer all the files. Or users are allowed to press “Ctrl” and click to choose certain files to transfer, and then right click the chosen files to “Transfer to > iPhone”. If users want to find the certain files they want to transfer, they could user the smart filter function on the upper right corner. Type the full or part of the name of the file and click the search button (the magnifier) on the left of the search column, and then the software will find the matches for you. If users are tired of the list mode of the files, they can click the “Show as Cover” button (the button with dots) to the left of the search column, and goes back to list mode by clicking the “Show as list” button (the button with lines) next to “Show as Cover” button. If the users have clicked the transfer button, they will get to the dialog of transfer settings. In this dialog, users are able to transfer the files to iPhone. Check “Transfer to List: iPhone”, and click “Transfer Now”, then the files will be transferred to iPhone. Step 1: Connect both devices to computer and run the software. The iTransfer will automatically detect both of the iOS devices and show the Libraries of the iPad and iPhone. Select a library of certain files to transfer to iPhone. Step 2: Click the transfer button. Click the transfer button to transfer all the files in the library to the iPhone. Or press “Ctrl” and click to choose certain files and then right click the chosen files to “Transfer to > iPhone”. 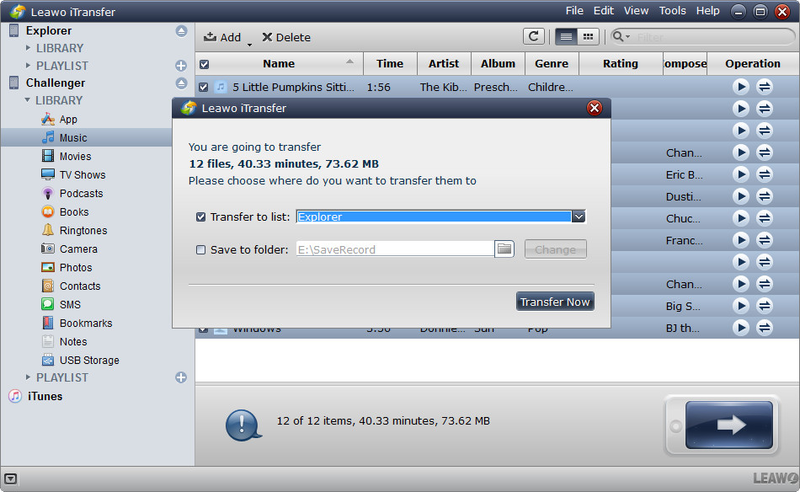 Step 3: Set transfer options and start transferring. A dialog of transfer settings comes out after clicking the transfer button or right clicking the chosen files to “Transfer to > iPhone”. Check the “Transfer to List: iPhone” and click “Transfer Now” to start transfer. If users want to transfer the files to computer, check “Save to Folder” and click “Change” to choose the target folder. Step 1: Connect iPhone to computer and run the software. The software detects the iPhone and shows the Library of iPhone on the left sidebar. Select a library to back up the files in that library to computer. Click the transfer button to back up all the files in the library to computer. Or press “Ctrl” and click to choose certain files. Right click the chosen files and choose “Transfer to > My Computer”. 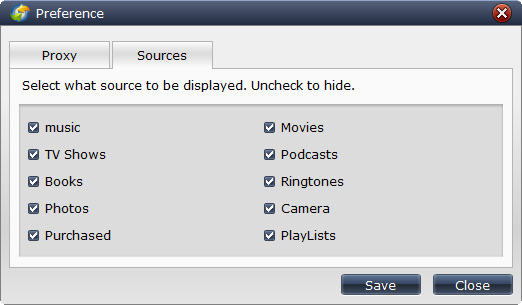 When right clicking the chosen files, users will find the following options: “Preview”, “Transfer to”, “Copy”, “Cut”, “Paste”, “Delete”, “Check All” and “Uncheck All”. The functions of the options are all the same like the above list in Part 1, and these options provide easier ways for users to handle the files. Step 3: Setup transfer settings. The dialog of transfer settings comes out after users clicking the transfer button or choosing “Transfer to > My Computer”. In the dialog of transfer settings, users are able to choose the location on the computer to put the iPhone backups. Users should check “Save to Folder” and click “Change” to choose the target folder. 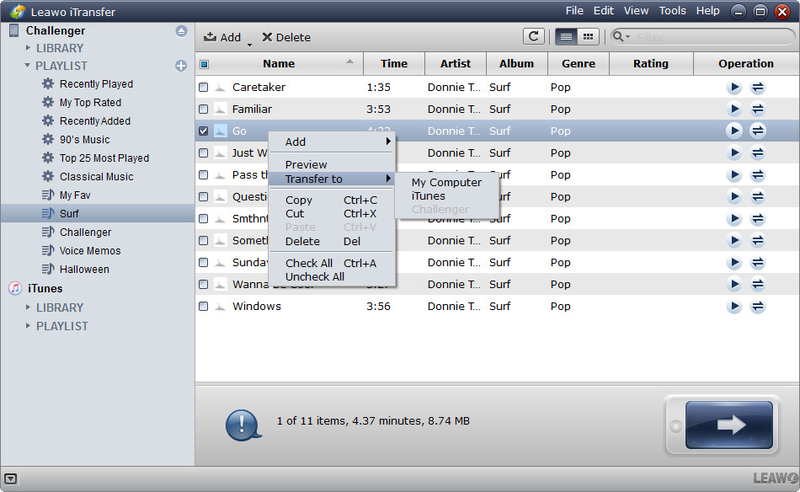 If users want to transfer the files to iTunes as well, they can check the “Save to List” and choose “iTunes”. Click “Transfer Now” to start the iPhone backup. Step 1: Connect iPhone to computer and run Leawo iTransfer. After the software detecting the iPhone, it will show the Library of iPhone in the left sidebar. At the bottom of the Library, users will find the column of “USB Storage”. 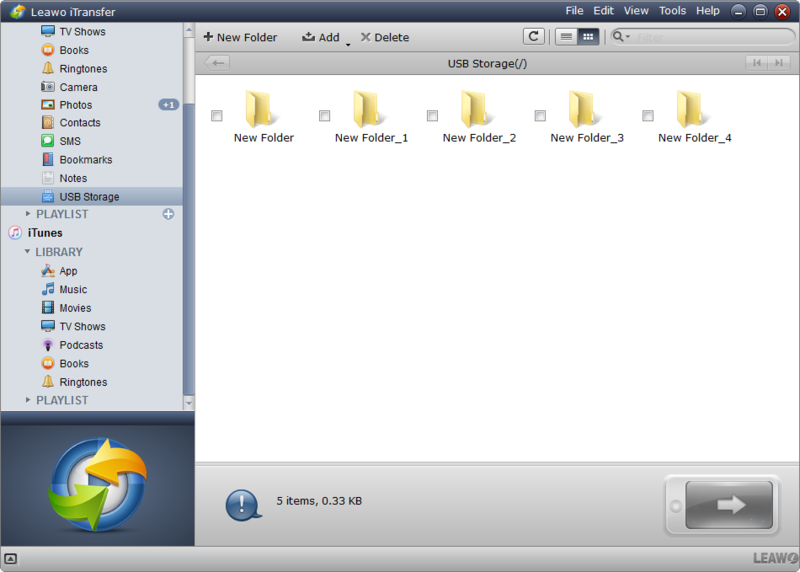 In the column of “USB Storage”, users are able to drag and drop any file into the software window without limits. The files in the “USB Storage” won’t be shown in the Library of iPhone, but only saves in it. The software will detect the iPhone automatically. 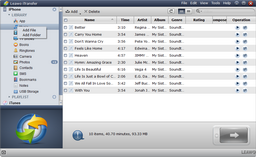 After detecting, the software shows the Library and Playlist of iPhone in the left sidebar. The Playlist of iTunes is below the Library of iTunes. 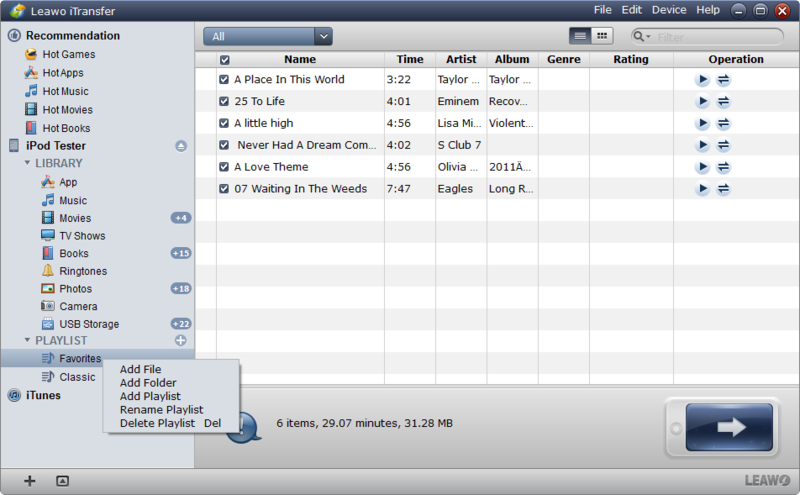 Step 2: Add music files or music folder to playlists of iPhone/iTunes. If users want to move computer music into the playlists of iPhone/iTunes, they should click “File > Add > Add File/Add Folder” or right click the name of playlist to add music from computer. 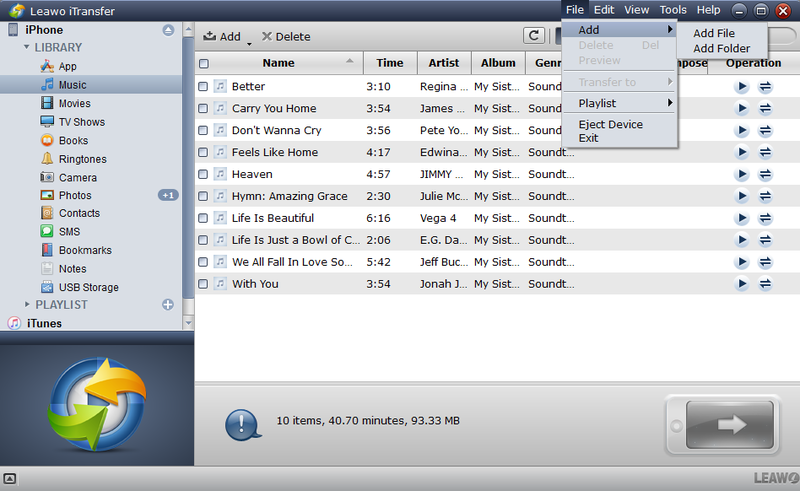 After choosing music files, click “OK” and the transfer begins. 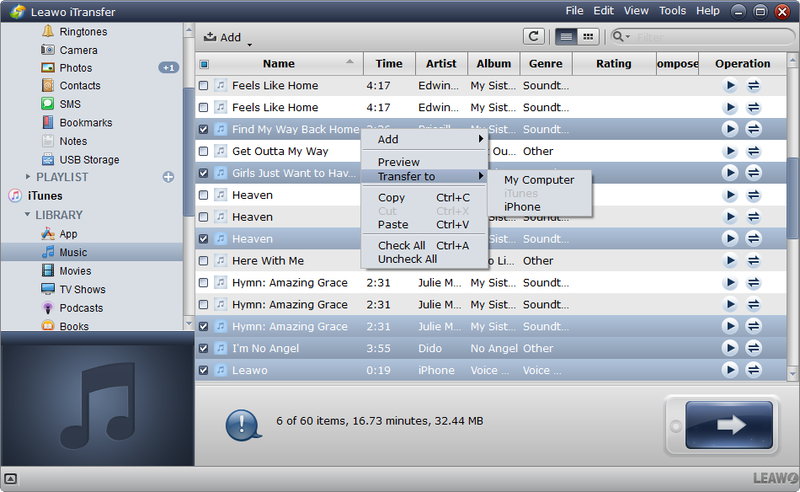 If users want organize or manage the playlists of iPhone/iTunes, they can user the “Copy” and “Paste” options which have been mentioned above. Users are allowed to copy songs in the Library of iPhone to the playlists of iPhone and copy songs in the library of iTunes to the playlists of iTunes.